The College of Education and Social Services is pleased to invite its graduate and doctoral students to submit proposals for the Higher Education in China Internship Summer Program. Funded by the Freeman Foundation, the internship will cover all expenses for a 3-6 week internship for two graduate students at institutions of higher education in Inner Mongolia, China. The internship is designed for graduate students interested in expanding their knowledge on the Chinese education systems and for those who wish to pursue a career working with international students. The inspiration behind the internship began nearly a year ago when CESS hosted a delegation from the Inner Mongolia University Arts College. 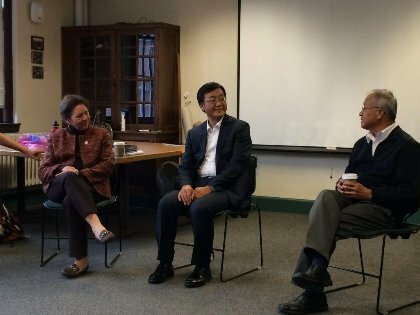 A leader of the delegation, Mr. Hu, principal for the Affiliated Middle School at the Arts College of Inner Mongolia, along with Professor Emeritus Dr. Wang Juefei, joined Dr. Deborah Hunter in a panel discussion on higher education in China for HESA graduate students. In the hour-long discussion, HESA students were introduced to the grueling National College Entrance Examination process that Chinese high school students go through before being allowed to attend college in China, the affordability of higher education in China, and some of the reasons why so many families in China are opting to send their children to university abroad. The panel discussion highlighted for the HESA graduates the parallels and differences between the education systems in China and the US. "Given the increasing number of students from China attending American universities and high schools, and the fact that so many of our graduate students will go on to be educational leaders at K-16 schools post graduation, it just made sense to offer graduate students in CESS a chance to experience first-hand Chinese culture and their education system in order to better support these international students from China." explained ASOP coordinator Jacqueline Drouin. Between 2000 and 2014, the United States saw a fivefold increase in the number of students coming from China. As many academic institutes have aggressively recruited Chinese students to their institutions, reports have also noted that many institutes are unprepared for supporting these students who are unprepared for the American college experience. “There are so many students from China at UVM and at other educational institutions across Vermont, both at the high school and collegiate level, it seems imperative that our educational leaders know how to best support them to ensure their academic success.” Explained Drouin. Upon completion of the internship, the graduate students will be asked to present their findings to their colleagues in CESS.